DER GREIF has been invited by Lars Willumeit, curator of the Krakow Photomonth 2016 Main Program – »Crisis? What Crisis? !« – to perform A Process 2.0 during the opening weekend at the festival centre. A Process 2.0 questions photography in its digital form as a distinct medium, its handling with the use of the Internet as well as photography’s haptic stimuli and common perception of authorship. 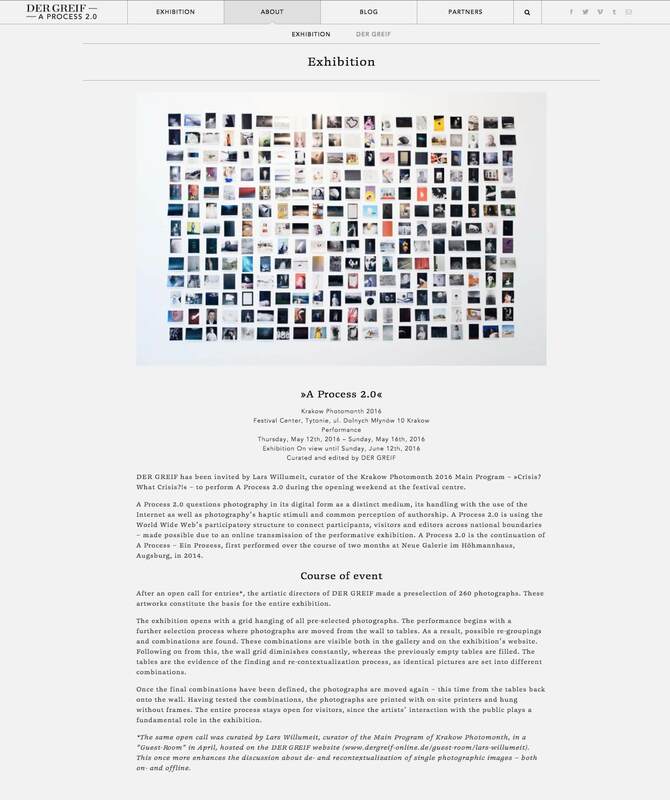 A Process 2.0 is using the World Wide Web’s participatory structure to connect participants, visitors and editors across national boundaries – made possible due to an online transmission of the performative exhibition. A Process 2.0 is the continuation of A Process – Ein Prozess, first performed over the course of two months at Neue Galerie im Höhmannhaus, Augsburg, in 2014.